Rajasthan has a diverse culture. Rajasthan has been a land of festivals, traditions, and delectable food culture. The cultural heritage of Rajasthan attracts a lot of tourist from all around the world to come and explore ‘The Royal State of India- Rajasthan’. Like other traditions, Rajasthan has a very rich and diversified dance culture. Rajasthani Folk dances are an important part of it. There are many forms of folk dances in Rajasthan which are very pleasing and attracting and are enjoyed by all age group people. Some of these dance forms are very unique and difficult and requires skilled people to perform them. Some dances tell narrative stories in a very captivating way. Danced like Ghoomar and Kalbeliya of Rajasthan have received international recognition in the past few years. Other dance forms like Kathputli (Puppet) and Bhavai are major attractions for the tourists. Rajasthani folk dances have emerged from different communities and tribes. These were mainly used for the entertainment of the royal family and Kings. There are also Rajasthani folk songs in the form of ballads which tells about love stories and heroic deeds of the past and other religious songs called ‘bhajans and Vanis’. Today we are going to discuss some of the popular folk dances of Rajasthan. Ghoomar or Marwadi Ghoomar is one of the most popular and well-known folk dances of Rajasthan and India. This was started by the Bhil tribe and later became popular with other royal communities of Rajasthan. This dance is performed by females on special occasions and festivals like Teej and Holi. Performance wears a traditional dress called ghagra with kanchil or choli. It involves graceful movements – spinning around with swaying hands, palm beats while singing folk songs which leave the audience mesmerized. Kalbelia dance of Jaisalmer is recognized by UNESCO as Intangible Heritage. The women of the namesake tribe perform this dance on the traditional music played by the men. Women wear black ghagra with a jacket-like costume called angrakhi and an odhani. This is also called ‘Sapera dance or ‘Snake Charmer dance’ because of its dance moves which are mostly like a serpent. This is a ritual dance form of Rajasthan. It is a very difficult form of dance and it needs years of practice to master this dance. It involves women who balance eight or nine brass ‘matkas’ or earthen pots on their head while they move within the circumference of a glass or a brass plate. Men play music using traditional musical instruments like Dholak, Sarangi, and Harmonium. This Rajasthani folk dance is performed by many communities of Rajasthan like Jats, Meena, Kalbelia, Kumhar or Bhil tribe. 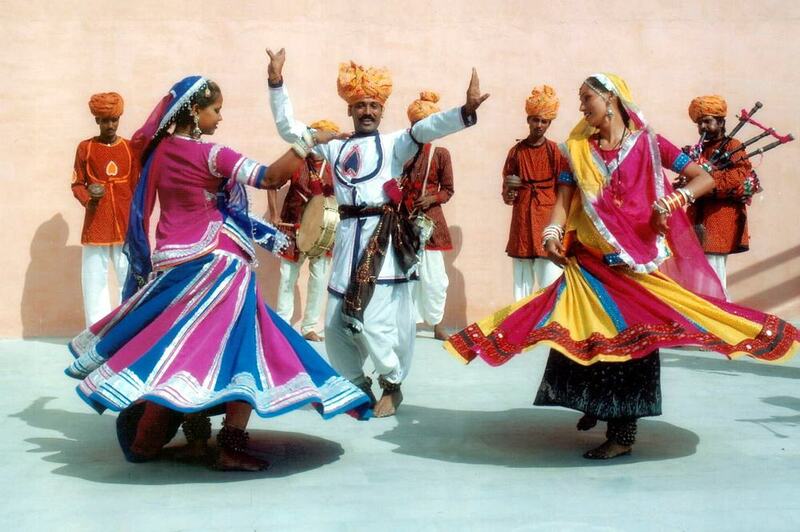 This is another famous folk dance of Rajasthan. This is performed using Puppets made of wood (kathputli) which are held using strings and are controlled by the puppet artists. The dance form was created by Bhat tribe of Rajasthan. The artists use different puppet voices to converse among the ‘Kathputlis’. They tell religious, mythological and other love and heroic stories using puppets. This also includes acts based on social issues. This is another famous folk dance from Rajasthan which depicts stories of the local bandits living in that region. Started at a place called Shekhawati in Rajasthan, Kachchhi Ghodi is performed by men who are dressed in traditional dhoti-kurta with a turban on the head. Men are shown riding on decorated puppet horses and energetic music is played in the background using drums and flutes. It involves moves like sword fights. It is generally performed on various social occasions and weddings. Started by the Bhil community of Rajasthan, Gair has become a very popular dance form which is performed on various occasions and festivals like Holi and Janmashtami. It is performed by both men and women dressed in traditional clothes. Men carry sticks, swords, and arrows while dancing. Performers perform graceful steps in clockwise & anti-clockwise circles on the beats of traditional folk music. The act becomes very dramatic when men hit sticks in a strong rhythmic pattern. This Rajasthani folk dance is performed by women who balance chari or pots with a lighted lamp in it on their head while they dance on beats of dholak, nagada and other traditional instruments wearing traditional outfits. This is performed on special occasions like marriages, festivals or the birth of a child. These are the list of few famous folk dances of Rajasthan. There are many and many other folk dances like Walar Dance, Chakri Dance, Khayal Dance, Gawari Dance, Terah Taal, Chang and drum dance and fire dance which are very popular in Rajasthan. If you get a chance to visit Rajasthan, do witness these wonderful forms of dance.